And the wedding planning marches on. The caterer is booked, the venue deposit has been made, the DJ do-not-play list is underway, the dress is bought. That means our next step was to get out our Save the Dates! Now, I am not one of those girls who has had their wedding planned out years ahead of the ring. I didn't know what I'd be wearing, where we'd be or what color the bridesmaid dresses would be, but for the last four or five years I have known what my unique Save the Date would look like. 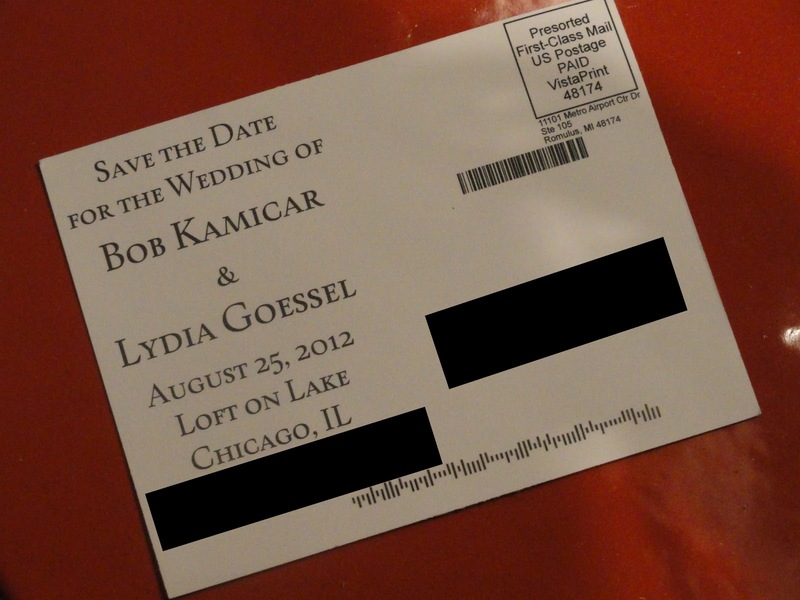 Just as I had known for awhile what my Bridesmaid Invites would look like (check those out here) Without further ado. . . 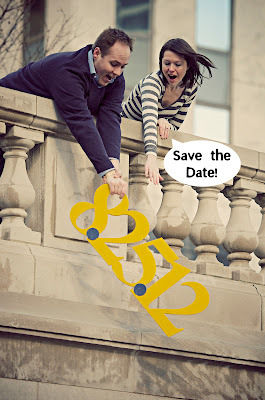 I'm not sure how it popped in my head, but the idea of "saving the date" in the literal sense seemed to be a fun spin on the Save the Date. I keep looking on Pinterest and other sites and have not seen the same concept yet, but I'm sure I'm not the first to think of it. Original thought was to photoshop the date into Bob's hands. Unfortunately, we do not have photoshop and I wanted to make sure it didn't look too cartoonish or fake. Michaels had a healthy supply of wooden craft letters, but they all ran a little small or flimsy for our purposes. I perused some websites and stumbled upon craftcuts.com. I ordered "82512" in 12 inch letters, 1/2 inch thick. Instead of having to glue them together when they all arrived, we had the option of ordering the numbers scrunched together - perfect! Upon arrival we painted the sign a mustard yellow to match our wedding colors and I added a couple painted blue cardboard dots to mark the date distinction. I almost ordered "8-25-12" but didn't want to pay for an extra two characters. The photo we would use came out of our engagement shoot. This took place on a chilly February Saturday Our photographer, Gilbert Reyes of GReyes Photography, and his wife were troopers as we dragged them around from the loop to museum campus. We fit in a costume change, but it actually looks like we had more outfits than we did because there were certain shots I just flat out refused to take off my coat. 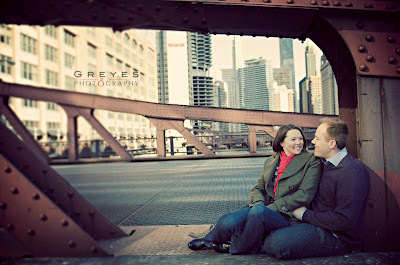 Did I mention we did this shoot in the middle of a Chicago February? Check out highlights from the shoot on GReyes facebook page and be sure to email him for any photo shoot needs you may have! Gilbert passed along our winning photo straight away so we could get our postcards ordered. I used paint to add a word bubble to solidify the joke, but at the last minute realized the photo quality diminished greatly when I saved it as a .jpg. It looked okay on the web, but might look pretty poor when we ordered our postcards. Instead, I used the free (but not available for much longer) site Picnik to create the card. This was then uploaded to Vistaprint where we created the front and back of a postcard and then uploaded a mailing list to have them mail the cards directly. This freaked me out a little bit, not seeing the finished product before they went out in the mail, but it was definitely a time savings. We ordered an additional supply to mail out as one offs for the few folks we didn't have addresses for/extra invites that occur along the way. I had purchased a Groupon last month for Vistaprint, which got us $70 for $17. This savings was very helpful, considering I spent about $60 on the wooden numbers. The order was placed and a week later the texts started to come through that they were finding their way to recipients' mailboxes. I breathed a sigh of relief that the order stayed intact. 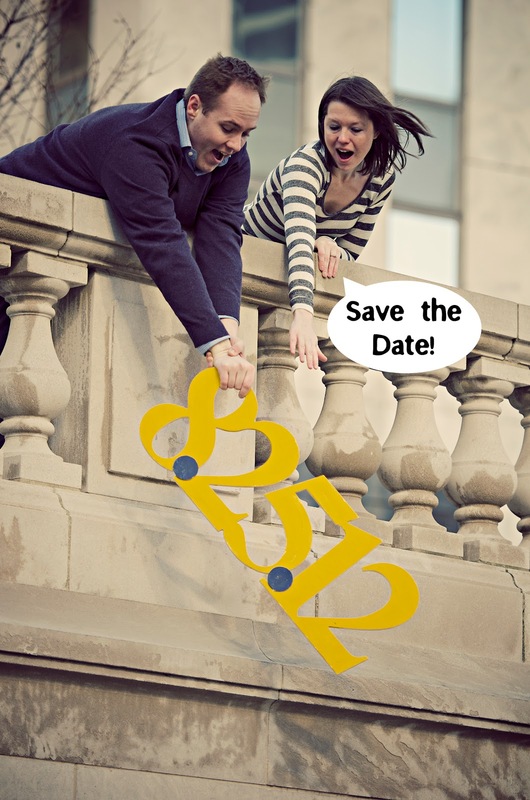 I'll let you use your imagination, but if budget and time were no option, here were my alternate ideas for "saving the date"
So how would you save the date? This is very cute and clever! Well done! I do have an alternative to suggest for the expensive numbers. You can use Kinko's to print out the numbers in whatever size you like. Each number could be poster size, if you like, or print the whole series as a banner. 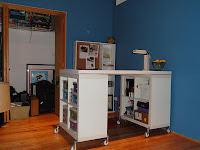 Then take the print and glue it to foam core (from Michael's, Hobby Lobby, etc. ), and cut out with an exacto knife. If you make individual numbers, you can fasten them together with glue, tape, staples... any number of ways. Now of course, the larger the prints, the greater the expense, but I think you could create something comparable to the ones in the photo and get away with spending a lot less than $60 using this method. That's a great tip - we like the memento aspect of the wooden numbers, but foam core is a great option! I LOVE this!! My husband and I did the same thing for our wedding last year (http://pinterest.com/pin/46654546109730474/). So cute! Good luck in your upcoming planning! Love that version! I knew I would see another one eventually! Very cool. Love the idea! Do you remember what font you used in your order? Thanks! I'm sorry, I don't recall what font I used! It was before we picked our "official" wedding font of Peignot Bold, so I think I just went with something like Garamond. That's fun. Those are fun ideas for any couple that's planning a wedding. I like Vistaprint because you get quality and low prices as well. Most people who have used them for their business or personal life have good things to say about their service. Nice ways to reduce the costs. That's a whole lot of planning. I still think this is the most brilliant idea in the world. It turned out SO WELL! Can't wait to see what else you have up your sleeve! Thanks for sharing this post.If you have any problem related to the PC and Laptop then you can contact us we are here to provide you the complete solution to your problem. great post, we provide dell tablet support service , if you have any problem you can contact with toll free number +44 800 014 8212 dell tablet support.